I’ll assume most of you have heard of Superman at some point in your lives. He’s one of DC Comics’ most iconic characters, and if you paid attention during Kill Bill: Vol. 2, you’ll know that unlike most superheroes, Superman doesn’t need a costume to take on the identity of a heroic alter ego who thwarts evil. The mythology surrounding Superman has him being sent away from a dying planet, Krypton, as an infant. The young Kal-El arrives on Earth and is raised by Jonathan and Martha Kent, who live in rural Kansas and name him Clark Kent. Only as he grows up does Clark Kent become aware of his superhuman abilities like strength, speed and heat vision, which he then uses for the benefit of mankind as Superman. The character has appeared in DC Comics since 1938. Each respective decade has seen modifications to Superman’s ethical imperatives vis á vis the issues of the day: fighting Nazis in the 1940s, being a good suburban role model in the ‘50s, etc. Recently, some conservative outlets have taken issue with Superman’s portrayal as a defender of undocumented workers. In Action Comics #987, released earlier this month, Superman steps into a scene where a white, middle-aged man who has just been laid off from work loads up a machine gun and opens fire on a group of undocumented workers whom he thinks have cost him his job. 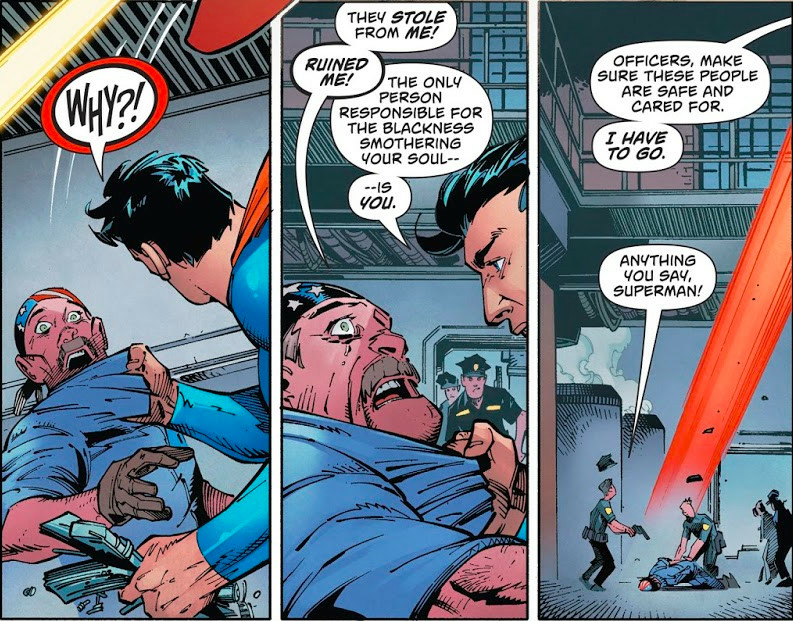 With principled stoicism, Superman replies, “THE ONLY PERSON RESPONSIBLE FOR THE BLACKNESS SMOTHERING YOUR SOUL—IS YOU.” As police officers enter the scene to apprehend the shooter, he flies away and instructs them to care for the would-be victims. It’s hard to imagine wrongdoing on Superman’s part in this scenario. Categorically, there should be nothing reprehensible or even questionable about his decision to step in and defend these bystanders. Still, that didn’t stop media outlets like Fox News and Breitbart from politicizing Superman’s actions in the comic and claiming a pro-immigrant agenda on the part of the authors. “The Man of Steel has now become a propaganda tool for the defenders of illegal aliens,” bemoans a column by Fox News’ Todd Starnes. “Instead of rounding up the illegals and flying them back to where they came from, the Man of Steel snatches the white guy…” Starnes laments. These conservative writers seem to be incensed that Superman is standing up for undocumented workers rather than throwing them out of the country. They are also likely outraged that he confronts the toxicity of white supremacy, which has been raging in our country since the onset of the Trump administration. One really wonders what these commentators would have had Superman do in this context. Should he have stood by idly as the bandana-wearing white supremacist opened fire on these bystanders? They were in this country “illegally” to begin with, these writers might claim, and hence, maybe they had no right to protection under the laws of this country. Perhaps Superman should still have stepped in and saved these workers, but then promptly flown them back to their countries of origin? Greene goes on to explain that undocumented immigrants are often denied legal protections afforded to those accused of committing a crime due to their unauthorized status constituting a civil infraction. This does not by necessity entail criminality and illegality, however. Should Superman have taken deportation of this group of bystanders into his own hands? Only if you consider that legally, undocumented workers are guilty of an offense as grave as disorderly conduct. And if you’re willing to deport some people over those kinds of offenses, why not apply an impartial legal standard and deport all citizens over similar infractions? Of course, we wouldn’t do that. That would be ridiculous—kind of like these conservative columnists. Featured Photo Credit: Courtesy of Gareth Simpson’s Flickr.